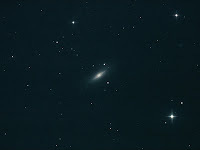 I felt the moon was far enough away to have a try at M102 which was well placed in my sky. After some initial problems with the dec drive slipping I managed to get an untroubled series of subs once a few screws had been tightened. Details: 5x 7 minute exposures @ iso400 + 5x 7 minute exposures @ iso800 with CLS in DSS & CS2.